I am very happy that Jessica @ Rabid Reads stumbled upon this little gem and that I let her review convince be to pick upBloodfire (BTW - are you noticing a trend? So far, Jessica has not steered me wrong!). I love the characters and I'm really excited to see where the series will go. Mack is exactly the kind of female heroine I like - strong, snarky with a healthy temper that lands her bunches of trouble. Mack was raised by a pack of shifters (of all kinds from werewolves to were gerbils - a point I most definitely laughed at BTW), though she isn't one. Which is breaking a cardinal rule for shifters -- humans are not to know of their existence at risk of death. Her family of shifters are under a geis not to tell, but even without it they would almost all keep her secret, because she's part of the family - human or not. And she's part of the family, in part, because she does her part to keep them safe. She's tough and a stronger fighter than a good number of them. And when her temper gets going her blood literally boils, giving her added strength. Oh and they alpha can talk to her psychically, just like the rest the pack. Are you thinking that doesn't quite sound human? Yeah - so was I. But not Mack and not any of her pack. Thankfully I was prepared for this bit of ridiculousness from Jessica's review, so I'll just tell you that while I wholeheartedly join her in that eye-roll, it doesn't take away from my love of this book much. I also loved most of the pack - though I seriously wish I'd gotten to know some of them better. Their genuine love of Mack - up to a willingness to risk their lives for her - quickly endeared me to them. But, while they are memorable as a collective, the individuals didn't really stand out to me much. Her best friend - Tom - is the only one that really truly stands out to me and even he lacked serious development. And that's because Mack and Corrigan, Lord Alpha of the Brethren (the group that rules the shifters and will kill all of them for keeping Mack secret), really dominated the story for me. 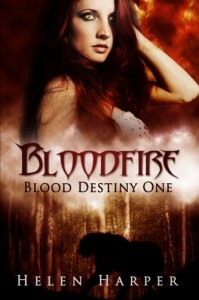 The story for Bloodfire all kicks off after the pack's alpha is mysteriously and brutally murdered. This is devastating for the pack, obviously, but particularly for Mack who's looked to him as a father figure. She's determined to find the murderer and make him/her pay. But the snafu is that the Brethren is coming to oversee the change of Alpha and to investigate the murder. Which means a greater chance that they could discover Mack's identity. The plan is for Mack to masquerade as an extremely weak member of the pack and keep a low profile. Now does that really sound like it would work, based on how I described Mack? Yeah, exactly - that's so not the kind of person Mack is. She really does try, though. I was actually surprised by how committed she was to keeping a low profile. Problem is, Corrigan suspects too much and bit by bit her true colors are starting to show. And some members of the pack don't want her around and are using this moment of interference to attack her weaknesses. So will she manage to solve the mystery and avenge her alpha's death, while also protecting her pack by keeping her true identity a secret? That question kept me on the edge until I plowed through Bloodfire in just two sittings. The world is well written, the action keeps coming, and there were only a few eye rolling moments. A definite for fans of Urban Fantasy!